The royal mom of three, 37, admitted she's feeling "broody" as she met an adorable 5-month-old baby during her and Prince William's tour in Northern Ireland on Thursday. Can you see Kate and William having another baby? "Baby number four?" Barr asked Kate. Kate replied with a laugh, saying: 'I think William would be a little anxious'. Kate wore a new, blue, $3200 coat by Mulberry for the walkabout with a repeat blue Jenny Packham dress, her navy Rupert Sanderson courts and matching clutch by Jimmy Choo. Prince William appeared to take the challenge seriously, tilting the pint glass and watching the tap intently before exclaiming "Look at that bad boy!" as he admired his work. There, William and Kate took part in a canoe race as well as other fun outdoor activities. The royal couple then watched a group of young people perform a play about divisions and riots in Northern Ireland. They then travelled to County Fermanagh to visit a youth centre, before returning to the capital for a party at the iconic Belfast Empire Hall. The Duchess of Cambridge turned heads when she arrived at the city's Empire Music Hall this evening in a sparkly green cocktail dress by Missoni. 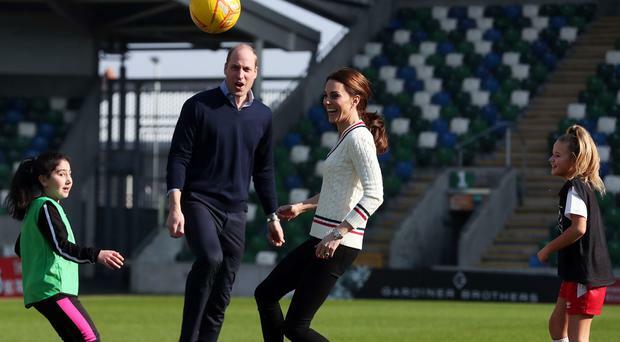 They started their visit with a trip to to Windsor Park today, where they got some insight into community football projects and had a kick about. She and Prince William are also the proud parents of three year old Princess Charlotte and five year old Prince George. The first day of the royal couple's tour focused on promoting the positive impact sport, nature and the outdoors can have on childhood development. It said nearly half of companies surveyed believe Chinese policies are enforced differently against them and local rivals. He said if progress is made, he will meet Chinese President Xi Jinping at his Florida resort to finalize an agreement.